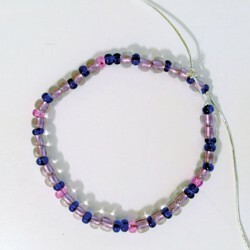 Write your own name or nickname in binary code using beads on a bracelet. Hints for uses in your library This craft has been successfully adapted for library programs for children and teens. Make sure to provide a copy of the binary key to each participant. 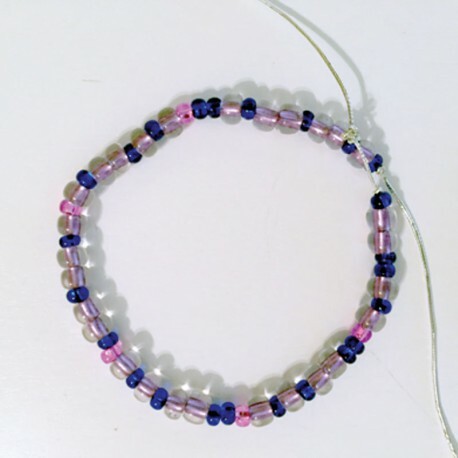 Have a third bead color to use as a separator between letters. Shorten this activity by translating initials or brief words instead of the participants' names. It's a good idea to have extra materials, in case the participants would like to make necklaces with their full names or a phrase. We did this at our library as part of our weekly "Tinker Tuesday" program for school aged children. The older kids enjoyed it (I think the PLUR factor of the pony beads helped) and liked learning about binary. We also had a few pre-K kids join in, and their parents helped. 1-4 first graders didn't seem too interested, however. To save time in working with a large group and a wide variety of ages we used pipe cleaners instead of string, so we didn't have to worry about tying knots or the beads sliding off. Would recommend for tweens.